Getting a good value for your money is essential when it comes to outsourcing your blogging. You want to get enough content on your blog to build your audience. You’ve taken a look at competitors and freelance blogger packages to get an idea of frequency that you need. The problem is you have more questions. Some of your competitors are blogging daily, but others stick to just one post a week or two. When it comes to the bloggers for hire, some are offering one-off posts, while others offer packages for 10, 20, or even 100 blog posts a week! Yes, there are some that offer triple number blog posting packages! Does that mean you need all these blog posts? Should you post multiple blog posts per day? Is quantity really that important? Honestly, I want to give you a straight answer, but there isn’t a straight yes or no answer for this. For some websites, 100 posts per month will work out. You’ll need a team of writers for this and it’s usually reserved for news sites where there is constant information to get out there. The majority of business blogs won’t need hundreds of articles or blog posts a month. Even if you want to guest post as well as post on your own blog, you won’t need this amount. But what about 10 or 20 blog posts per month? 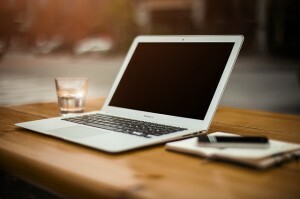 Could you get away with just one blog post a month? Here’s a look at some considerations to make when deciding how much your freelance blogger should blog. How much content do your readers want? Are they used to one post a month or do they prefer the daily updates? It’s important to find a balance between not posting enough and posting too much. Someone may view daily posts as spam, but not receiving something for weeks on end means you’re forgotten. Posting once, twice or maybe three times a week is the standard for blogs that I’ve worked on in business. But that doesn’t mean that is the only place to post your content. You could opt for guest posting, or even share your articles via article directory sites. You can opt for the large packages and spread your content to as many places online as possible. It’s not all about quantity. Sure, daily posts will get you noticed by Google, but that isn’t always a good thing. Google wants to know that you’re offering quality, interesting, unique and engaging posts. More importantly, the posts need to be relevant. 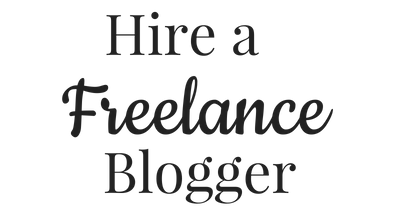 You need a freelance blogger who is able to create high quality content at the rate you have agreed upon. If you and the blogger can’t come up with the quality ideas for a daily schedule, then you need to start thinking about other options. A weekly schedule may be more your style. This is something to talk to the freelance blogger for hire about. He will know his own capabilities, and will be able to share any worries or issues with you. Instead of blogging daily, you could look at updating old content with your new blogger for hire. You could also hire a social media manager to make sure your old content gets fresh eyes. It’s worth trying out different posting strategies. However, you will want to adopt one for two months or so to see how it works out. Avoid changing things too much when you do switch. Don’t suddenly go from posting once a day to once a week. Try cutting down to four a week at first, and then to three and then slowly down to one. Your readers are less likely to notice it, and you will slowly find which schedule works best for your blog. If you still want the extra posts, look into other places to post them. When you do make a change, you don’t have to stick with that forever. You may decide that you want to put out more content more frequently again as your audience develops and changes. How New Is Your Blog? 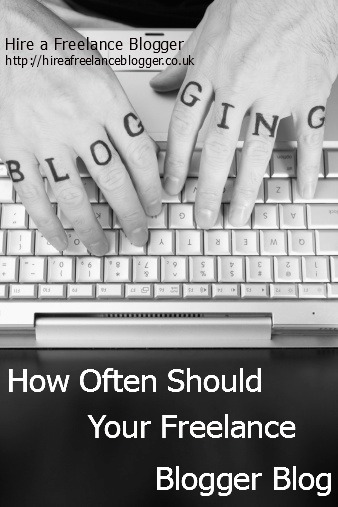 Think about the age of your blog. If you don’t currently have any content on it, you want your freelance blogger to act fast. Posting once a day is understandable or you may consider three times a week. With any new blog that I start, I get a two- or three-post-a-week schedule to start with to help get quality content on the site. If you’ve been blogging for some time and want to liven up a dormant blog, you could consider posting just once a week. There is already other content for search engines to pick up and for other people to read. Don’t forget to put your content on social media platforms. Just because you haven’t just published it doesn’t mean that it isn’t interesting or relevant. There isn’t a wrong or right answer when it comes to posting content. 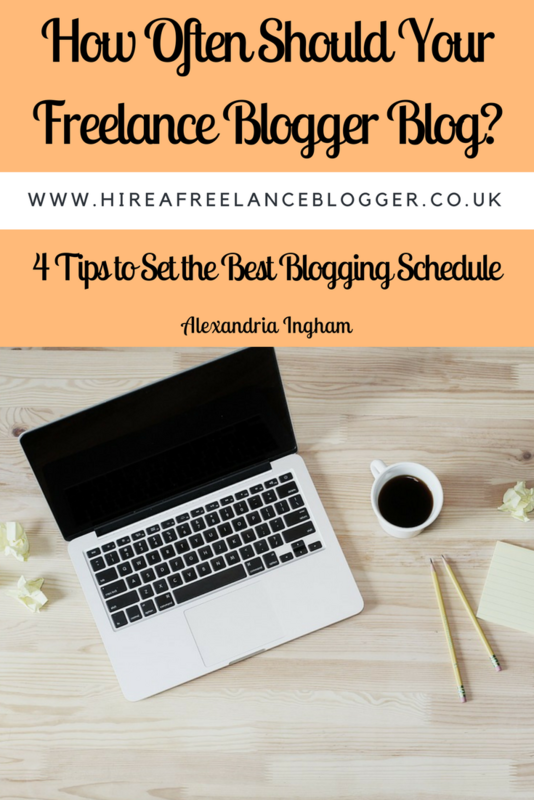 Your freelance blogger may suggest three times a week if your blog is new, just to get some content on it. After a few months, he may suggest limiting your posts to once or twice a week. It is a case of trial and error, but you will find something that works for you. If you want to chat about your specific blog and business, get in touch for your free discovery call. This is a great way for the two of us to chat about your needs and assess whether we’re the right fit for each other. Please note: this content was originally publised on MAy 20, 2014. I’ve updated it with some new, fresh content and images on April 26, 2017. 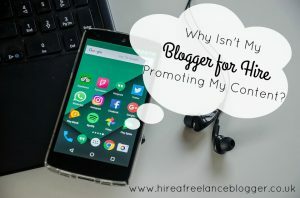 Why Isn’t My Blogger for Hire Promoting My Content? 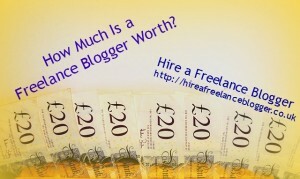 How Much Is a Freelance Blogger Worth? Well, I’m certainly guilty of a couple of those! Never occurred to me that changing instructions could be construed as trying to get two articles for the price of one. I’ll make sure I’m very clear in future.